The male/female set allows for easy indentification from both sides of the ear- you can see them coming and going! Tags are large enough to accomodate a variety of information. The male/female set comes with the stud and uses our standard applicator. Tags can be ordered blank, numbered or with custom printing. FREE shipping on all orders over $75 (US domestic). Perma-Flex sheep tags are made from durable, weather-resistant polyurethane and contain UV stabilizers to prevent the colors from fading. They come in popular colors for lots of coding options. The oblong shape is 2 3/8" x 7/8" and is a recognized standard in successful sheep tagging. 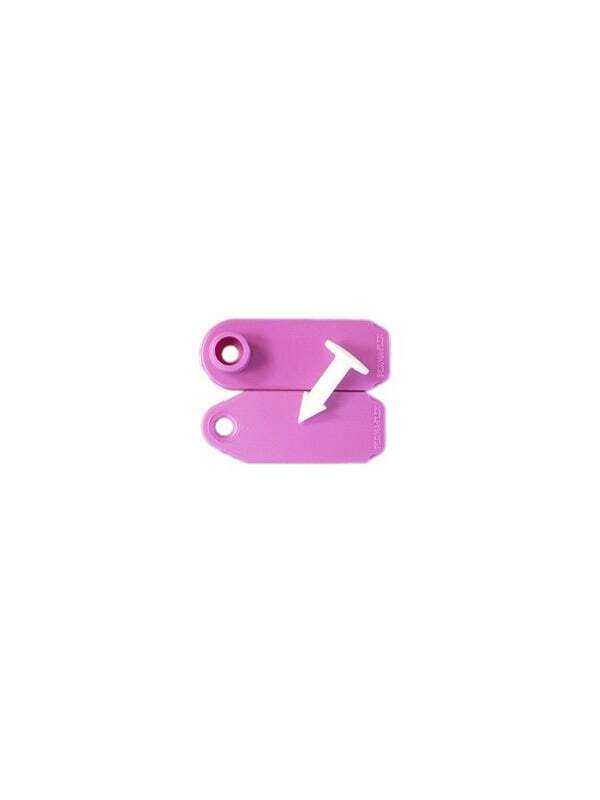 (As of June 2014 we no longer carry this tag in pink). Q. Do I need a new applicator to use Perma-Flex tags and studs? A. Not necessarily. We recommend using our applicators and cannot guarantee retention if you are not. However, if you have an applicator that you can unscrew the pins and replace them with our pins, your existing tagger may work. Just order a set of replacement pins and give it a try -but make sure you can unscrew the pins in your applicator first. Q. Can I just make my pins fit the Perma-Flex Daisy stud or regular stud? A. It's very unlikely. And as you know having that stud line up properly is very important. There is a small "grove" on the pin where our studs will actually "seat" so that you have the right alignment and the stud does not come off the pin prematurely. Chances that another manufactures' pin would have this grove in the right place is pretty slim. Q. How big will my numbers or text be on the tag? A. The size of the digit or letters corresponds to the size of the tag, how many digits you use and if you added text to the top or bottom line. As an example, if you use a medium size tag with numbers 1-99, we will make the digits as large as we can to fill the whole tag. If on the other hand you need four digits such as 1000-1100, the numbers will have to be a little smaller. Likewise having a line of text on the top or bottom will reduce the size of the numbers. Our rule of thumb is to always make the numbers as large as we can, but feel free to call or e-mail us with any special instructions. Q. How does the Daisy stud prevent snagging? A. The Daisy stud has a petal-like design (thus the name Daisy) and these petals will flex and bend to pull away from the snag. In a worst-case scenario maybe one petal might break off- but the rest of the stud will remain intact. Most snags occur at the back of the ear when the animal has their head in fence, bale wire, brush, etc. so this special stud greatly reduces torn ears and lost tags. Q. Do the marking pens really work? A. Our marking pens will truly last a very long time when applied correctly. The ink is acid-based and penetrates directly into the tag material (you can actually see this if you hold the tag up to light or cut the tag through the ink coverage). The key is to make sure you are using one of these special marking pens and also to go over the print area at least 3-4 times. Q. How long will the custom printing hold up? A. We will guarantee our print not to fade for two years. Our special ink uses an inkjet process and it will penetrate into the tag giving you nice bold print that will last. And depending on the environment, the ink may not fade for much longer period of time- but we know for sure we can stand behind the four year guarantee. A. We do require a minimum of 25 tags for custom printing. Once the minimum of 25 tags is met, they do not need to be ordered in multiples of 25. Blank tags and other products do not have a minimum requirement. Got a question not on the list above- just contact us by e-mail or toll free at 877-719-0877. We run new promotions often. Signup below to find out when! Copyright ©2019 Ear Tags Direct, Inc. All Rights Reserved.